For the professor of music, see Paul Berg (composer). For the snowboarder, see Paul Berg (snowboarder). 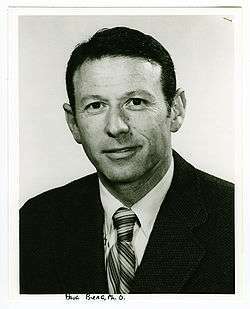 Paul Berg (born June 30, 1926) is an American biochemist and professor emeritus at Stanford University. He was the recipient of the Nobel Prize in Chemistry in 1980, along with Walter Gilbert and Frederick Sanger. The award recognized their contributions to basic research involving nucleic acids. Berg received his undergraduate education at Penn State University, where he majored in biochemistry. He received his Ph.D. in biochemistry from Case Western Reserve University in 1952. Berg worked as a professor at Washington University School of Medicine and Stanford University School of Medicine, in addition to serving as the director of the Beckman Center for Molecular and Genetic Medicine. In addition to the Nobel Prize, Berg was presented with the National Medal of Science in 1983 and the National Library of Medicine Medal in 1986. Berg is a member of the Board of Sponsors for the Bulletin of the Atomic Scientists. Berg's postgraduate studies involved the use of radioisotope tracers to study intermediary metabolism. This resulted in the understanding of how foodstuffs are converted to cellular materials, through the use of isotopic carbons or heavy nitrogen atoms. Paul Berg's doctorate paper is now known as the conversion of formic acid, formaldehyde and methanol to fully reduced states of methyl groups in methionine. He was also one of the first to demonstrate that folic acid and B12 cofactors had roles in the processes mentioned. Berg is arguably most famous for his pioneering work involving gene splicing of recombinant DNA. Berg was the first scientist to create a molecule containing DNA from two different species by inserting DNA from another species into a molecule. This gene-splicing technique was a fundamental step in the development of modern genetic engineering. After developing the technique, Berg used it for his studies of viral chromosomes. He was elected a Fellow of the American Academy of Arts and Sciences in 1966. In 1983, Ronald Reagan presented Berg with the National Medal of Science. He was elected a Foreign Member of the Royal Society (ForMemRS) in 1992. In 2005 he was awarded the Biotechnology Heritage Award by the Biotechnology Industry Organization (BIO) and the Chemical Heritage Foundation (CHF). In 2006 he received Wonderfest's Carl Sagan Prize for Science Popularization. ↑ Elizabeth H. Oakes (2007). Encyclopedia of World Scientists. New York: Facts on File. ISBN 1438118821. ↑ HowStuffWorks "Paul Berg". Science.howstuffworks.com (2008-10-21). Retrieved on 2014-04-03. ↑ Hargittai, István. "The road to Stockholm: Nobel Prizes, science, and scientists", p. 121. Oxford University Press, 2002. ISBN 0-19-850912-X. Accessed September 20, 2009. "Arthur Kornberg (M59), Jerome Karle (C85), and Paul Berg (C80) all went to the Abraham Lincoln High School in Brooklyn." 1 2 3 "Paul Berg – Curriculum Vitae". The Nobel Foundation. Retrieved 2011-03-25. ↑ "Paul Berg". HowStuffWorks. Retrieved 2011-03-25. ↑ "Research Focus | Clare Hall". www.clarehall.cam.ac.uk. ↑ Singer, Maxine; Berg, Pam (1990). Genes and genomes. Mill Valley, Ca. : University Science Books. p. xxviii. ISBN 0935702172. ↑ Carey, Jr., Charles W. (2006). American scientists. New York, NY: Facts on File. ISBN 978-0816054992. ↑ "Paul Berg". Chemical Heritage Foundation. Retrieved 5 May 2016. ↑ "CAP – Paul Berg". Stanford University. Retrieved 2011-03-25. ↑ "The Nobel Prize in Chemistry 1980". 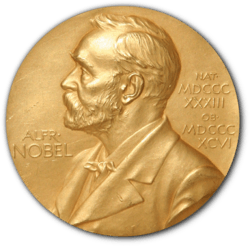 The Nobel Foundation. Retrieved 2011-03-25. ↑ "Book of Members, 1780–2010: Chapter B" (PDF). American Academy of Arts and Sciences. Retrieved June 16, 2011. ↑ "Professor Paul Berg ForMemRS". London: Royal Society. Archived from the original on 2015-11-12. ↑ Gussman, Neil (13 April 2005). "Paul Berg to Receive 2005 Biotechnology Heritage Award". PR NewsWire. Retrieved 5 February 2014. ↑ "Sagan Prize Recipients". wonderfest.org. 2011. Retrieved September 10, 2011. Wikimedia Commons has media related to Paul Berg. Paul Berg's discussion with Larry Goldstein: "Recombinant DNA and Science Policy" and "Contemporary Science Policy Issues"